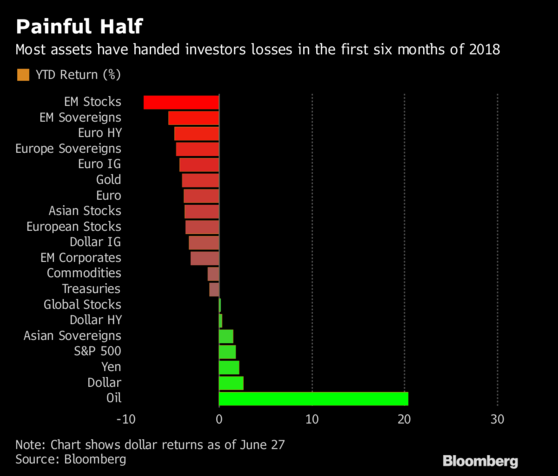 In recent weeks, Bank of America's strategists have turned decidedly gloomy on the market and the economy, warning on one hand that Europe simply can not be allowed to enter a recession as some €800BN in BBB-rated debt risks becoming a "falling angel" and flooding the junk bond market, while at the same time also warning that the global liquidity ushered in by QE has already turned negative. 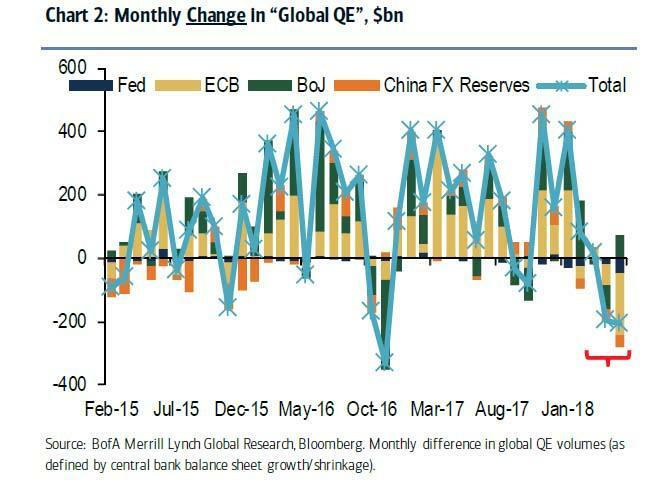 Now, in the latest "scare piece" by the bank's Chief Investment Strategist, Michael Hartnett - who correctly predicted the February market tumble to the dot - puts together all the recent events that have troubled markets, namely: Fed tightening, US decoupling, flattening yield curve, collapsing EM, outperforming levered quant funds, and says that these are "all echoes of 20 years ago." 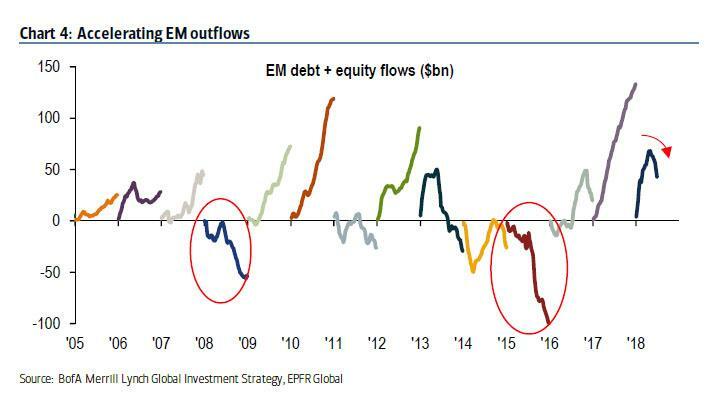 And the one catalyst behind Hartnett's troubling comparison is the collapse in EMs, which as we noted earlier, just suffered a near record outflow, a harbinger of even more weakness for the sector. And, as noted above, to Hartnett the "2018 Fed tightening, US decoupling (Table 2) & dollar strength, flattening yield curve, collapsing EM, outperforming levered quant funds…all echoes of 20 years ago"
... not to mention quants and trend followers who have gotten crushed. 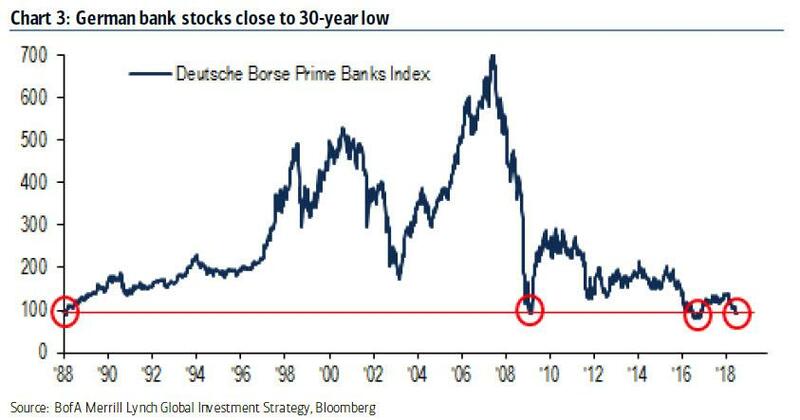 Here according to BofA is what to watch in 2018 for a repeat of 1998? ... leading eventually to the big outcome of the 1998 policy panic: the ’99 Tech bubble.